You’ll find Diamond Spas products in some of the world’s most beautiful homes, in respected luxury hotels and on some of the most impressive superyachts. The Colorado-based company manufactures copper and stainless steel spas, baths and swimming pools and was founded in 1996 by husband and wife duo Tom and Stephanie Bennett. Their goal was to create high-quality, durable spa products that do not compromise on style. Since its creation, the business has gone from strength to strength, expanding its presence across a number of industries, designing and manufacturing spas for the residential, commercial, hospitality, aviation and, of course, superyacht markets. It has worked on huge commercial ventures and smaller, more boutique jobs, and you can now find its spas in five-star resorts, on national university campuses, in professional sports’ training centres, on cruise ships and in some of the homes and on the yachts of the world’s most discerning people. The Diamond Spas product range is vast. The Spa Collection consists of spas, swim spas, swimming pools, cold plunge pools and water features, while the Kitchen & Bath Collection features soaking baths, whirlpools, Japanese baths, custom shower pans, bathroom vessel sinks, and bar and kitchen sinks. Products are available in stainless steel and copper, both of which ensure beautiful and durable spas. Neither metals will fade, crack or blister, both have natural antibacterial properties, and copper, in particular, can be shaped easily to enable innovative spa design. Diamond Spas also creates glass-walled spas and pools; there is no limit to its offering when it comes to creating your dream spa area. While the company works with customers from a variety of industries and on projects of all different sizes, it insists that every one of its clients is looking for the same thing: a unique, artistic, one-of-a-kind product created solely for their pleasure. Each project is approached with this in mind, as well as the brand’s three core principles: sustainability, durability and style. When it comes to sustainability, Diamond Spas is committed to ensuring its stainless steel and copper hot tub and spa vessel shells are 100 per cent recyclable and don’t end up in landfill at the end of their life cycle. Thanks to the metals’ superior resistance to bacteria, there is no need to use harsh chemicals in the creation of the spas, making them more environmentally friendly. They also operate under a chlorine-free water maintenance system, which is a more health-conscious approach for the customer. 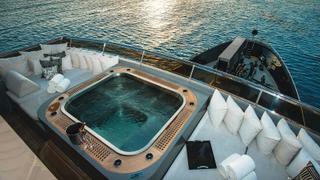 As well as the metals used to manufacture the spas being naturally very durable, they also weigh much less than those used in traditional spa and pool manufacture, making Diamond Spas’ products particularly suited to superyachts, as well as rooftop installation. The other key element of every Diamond Spas design is the beauty of each product, designed to blend harmoniously with more familiar landscaping materials, such as natural stone and foliage. 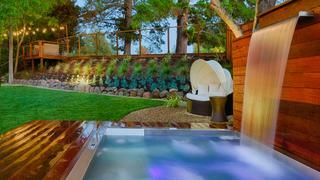 Diamond Spas has the knowledge and technology to produce some of the most advanced spas available. From multi-seating arrangements to hydrotherapy exercise areas, glass walls, vanishing edges, waterfalls and fibre-optic lighting, the options for design are endless, allowing the client to create the spa of their dreams. The company has recently added to its manufacturing facility, so it is ready to produce even more efficiently as it continues to grow.